Tomatoes are one of the easier seeds to save. With these simple instructions, you should have success! Cross-pollination notes: Tomatoes do not cross-pollinate very readily. If the seeds are for home-use only, there is no real need to separate the plants or shield them from one another. If genetic purity is important, separate different varieties by a minimum of 25 feet. 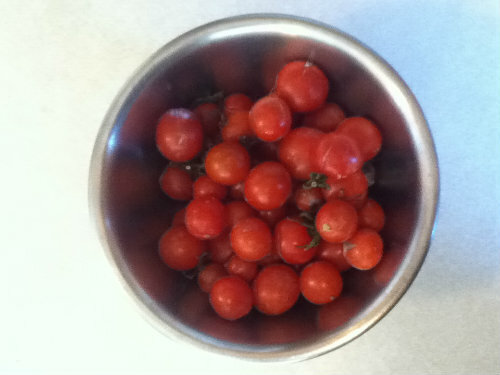 Step 1: Harvest a bunch of tomatoes. They should be at the peak of ripeness or a little over-ripe. Do not use underripe or diseased tomatoes. Here, we are working with cherry tomatoes. In step 2, the process differs if you are using cherry tomatoes or regular tomatoes. 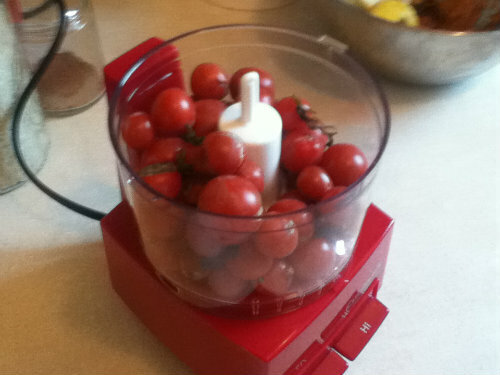 ...and blend them up until the tomatoes are completely broken up. You should have a chunky liquid at this point. If you are using regular tomatoes, slice them in half along their equator, separating them into a top and bottom half. You should easily be able to see the flesh of the tomato, and the open spaces between the flesh that contain pulp and seeds. 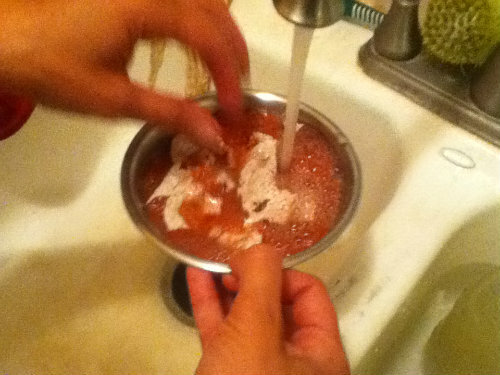 Squeeze the seeds and pulp out, into a bowl. You may find it helpful to use a spoon or knife to get the seeds out. Get as many of the seeds as possible and as little of the tomato flesh as possible. 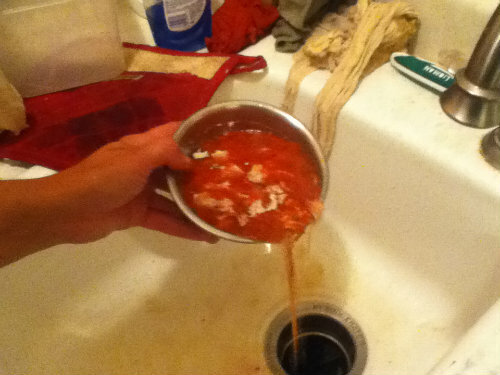 Step 3: Either way, you've now got a bowl full of tomato sludge. Put this on the counter somewhere where it will not be disturbed for a couple days. You want to be at room temperature, so that after a couple days, it will be covered in mold. The mold may smell a little, but it shouldn't be noticable from more than a couple of inches away. Don't worry, it's harmless, like bread mold. This process is called "fermenting" the seeds. Without fermenting the seeds, you will get low germination rates. 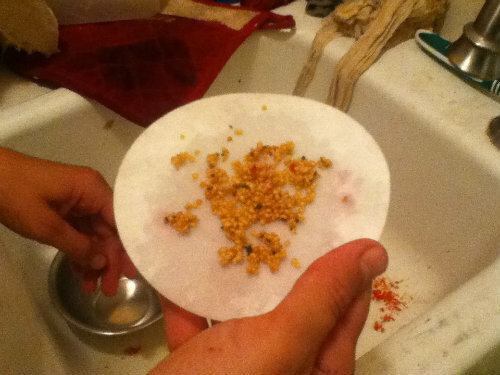 Step 4: Break up the mold to release any seeds that might be trapped in it, and discard it. 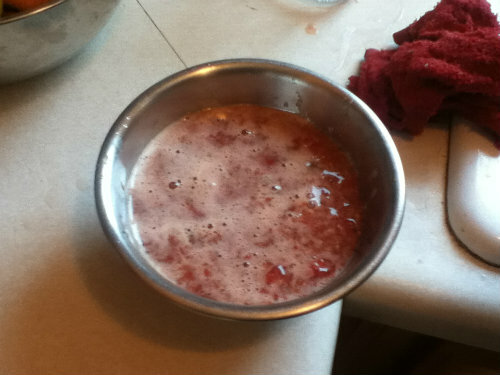 Step 5: You should now have a mixture of seeds, tomato chunks, and probably some mold left. The seeds that have sunk to the bottom are the good ones. The seeds that float are dead, so you want to get rid of them. Add some water to the bowl, and then pour off all of the floating matter. 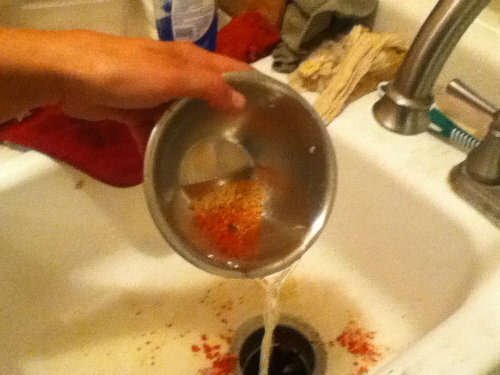 Get out as many of the tomato chunks as you can too, without losing any of the seeds that are sitting on the bottom. 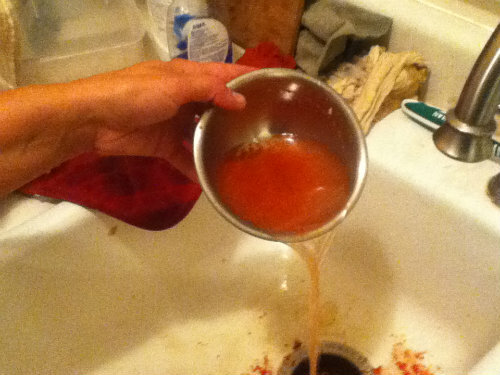 Add more water, pour off as much junk as you can, and repeat this process many times. If you had a lot of tomato flesh in with the seeds when you started, you may need to repeat this ten to twenty times before you get rid of all of the junk. As it gets cleaner, you may need to use your fingers to remove some of the remaining tomato flesh. 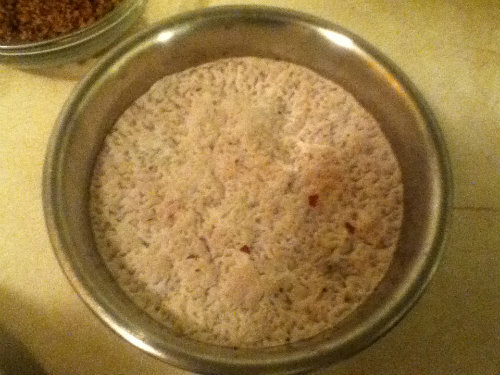 When you're done, you should have mostly clean water and just the seeds that were sitting on the bottom of the bowl. 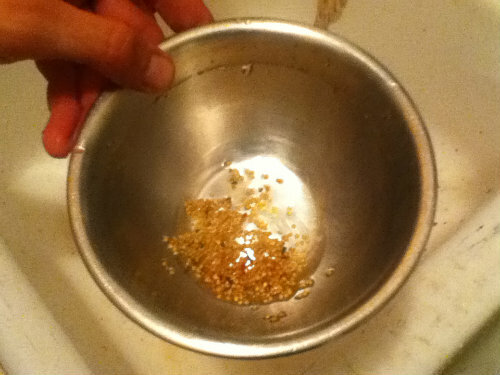 Step 6: Once you're down to clean seeds, pour off as much of the water as you can. 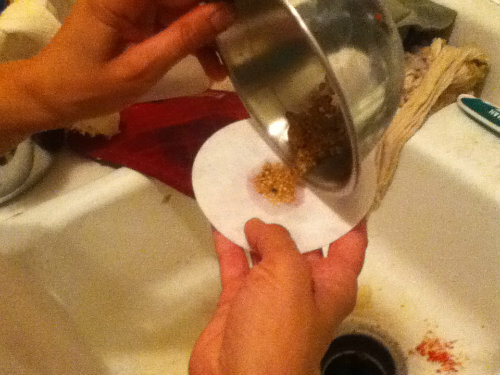 Pour the remaining seeds onto a coffee filter. Set the coffee filter on a plate, put the plate some place where it will remain undisturbed, and let the seeds dry for several days. Step 7: Once the seeds are dry, you may find that they are stuck together in little clumps. Gently roll the clumps between your fingers to separate the seeds. Pack the seeds in a ziplock bag or other airtight container. Label the container with the variety and the date, and store in a cool dry place. Congratulations! You've just saved a batch of tomato seeds!